Medtronic: It’s Not You, It’s Me. Breaking up is never easy. But I have to say “so long” to my Medtronic CGM. I took the plunge. Paperwork for a new Dexcom G4 CGM sensor system has been submitted to my doctor for approval. Look – I really wanted to like my Medtronic system. I gave it almost a year, and apparently the warranty only covers it for 6 months. (So – if I start seeing issues with it, I need to buy a brand new system anyway.) And I know my doc will be slightly disappointed that I won’t be using Carelink anymore. (I can’t really anymore anyway because of my computer issues.) But I can’t keep relying on the “direction of the sensor line, not the number in the sensor” if the sensor line doesn’t have a correct projected output. That kind of inaccuracy makes me really nervous when it comes to SHUTTING MY PUMP OFF IF I MISS AN ALARM! I’ve been woken up by many-a low alarm in the middle of the night. They are generally legit, but not always. So if my sensor is having a rough time, drops me to under 70 while I’m asleep when I’m really not… yeah, no. 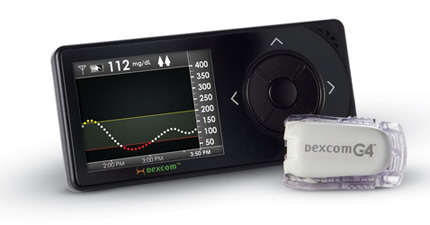 Sure – Dexcom has its issues too. (They all do… we’re trying to re-create the functions of a dead organ with our best guestimates.) But, I need to try something else. For everyone’s sake. Good luck with the switch! I’ve used the Medtronic CGM for almost three years — for awhile I was really close to switching — then (up until some things I’ve seen in the last 24-48 hours, both online and in personal experience) I was fully on-board with going to the Enlite. Now I don’t know what I’m going to do next. At least I’ve got time. I’m looking forward to your thoughts — particularly what you DON’T like about the Dex or what you miss about the MedT. I’m sure I’ll have lots of them. The biggest change that I think I’ll need to get used to quickly is the idea of carrying around two devices. Granted, the range on the Dex is pretty decent, those ballrooms at dance conventions are pretty huge/have a lot of technological interference. So – we’ll see. Another happy Dexcom G4 user here! I was using the 7+ when I got my new Medtronic pump, and during the training for it, the rep was showing me it’s CGM and how to use it, etc. I politely said, “no thank you,” and stuck with the Dexcom. Like everyone says, Dexcom has it’s quirks as well, but accuracy is SO good now, and being able to wear a sensor for 2 weeks or more makes me so very happy about not having to change out even more sites of robotic diabetes parts.